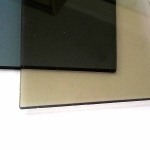 Tinted glass protects from sunlight and limits the penetration of ultraviolet rays into premises, preventing furniture and interior items from bleaching. 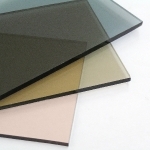 Tinted glass is used for glazing shop windows, windows and doors, in production of double-glass panes, in all-glass facades and partitions between rooms, in glass furniture, table tops, shelves and doors. Possible thickness is 4-12 mm. The company "Sklo-Service" presents tinted glasses of high quality in a wide colour range. We are always ready to show glass examples and give qualified advice to every customer.